100% Satisfaction Guarantee. WORRY FREE! ORDER NOW! Any problem please feel free to contact us. Unrivalled quality: Our bag will look just like new even after a long time use due to its durable and waterproof material. Featured with 3 layers and removable compartment, allow you to organize the cosmetic perfectly while travel, business trip, masquerade, show or home. ✔ Delicate Looking& Workmanship. The tidy and fine close stitching ensure the bags are sturdy and durable. ✔ Lightweight & Easy to Carry. Ideal for taking exactly what you need, anywhere, at any time. Can be used as a tote bag, shoulder bag even backpack. ✔ Large Storage Space & Capacity - Detachable part and divided section to keep all the necessities neat and in order. You can design yourself internal compartments by the adjustable padded dividers. ✔ Fantastic solution to store jewelry, toiletry, makeup paraphernalia like lipstick, makeup brush, eye shadow, nail polishes, eyeliners and hair accessories. All women's essentials in one elegant case. ✔ Easy to Clean - Black Foamed Nylon Insulate Lined for Easy Cleaning. ✔ Great Gift Idea: Amazing gift for family, friends, co-workers, presentations, birthdays, holidays and more. Smart 3 Layers Cosmetics Organizer: Strategically designed to provide ample space. Keep everything organized. The padded inner layer protects work well against vibration breakage. Durable design with water proof, shake proof, anti-wear and spill-proof interiors for long use. Unexpected Large Capacity: Measures at 16 In. X 11 In. X 5.5 In. 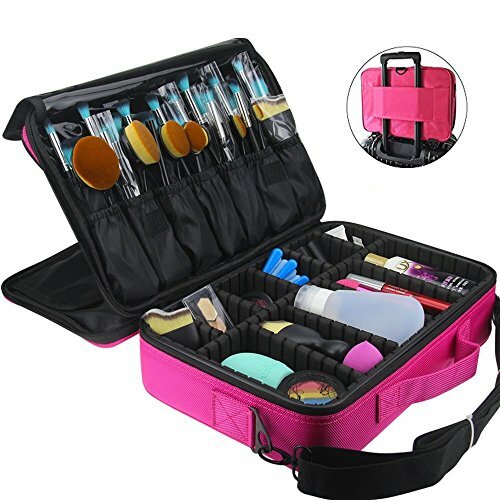 Super large space for collecting all the makeup tools like lipstick, makeup brushes, eye shadow, skincare products, nail art products, curling straight hair, Jewelry and other accessories. Lightweight to Carry: Hand strap for keeping your makeup safe and handy. Detachable & adjustable shoulder strap that eliminates shoulder fatigue and can be worn on shoulders or positioned across body. The back side can be fixed on the rod, reduce the burden. Great for traveling, business trip, working and home use. Multi Usage: Can be use as a train case, tote bag, electronic bag or essential oils bag as well. You can carry it as handbag, shoulder bag even backpack. 100% Money Back Guarantee. If you have any questions about this product by FLYMEI, contact us by completing and submitting the form below. If you are looking for a specif part number, please include it with your message.